The plan is being developed as moderate Democrats break from the party leaders’ policy of opposing a border fence, and it “is expected to include at least $5 billion for border protection efforts like new technology and more law enforcement agents, according to multiple aides,” said Politico. Trump is stepping up the public pressure on moderate Democrats and is focussing public attention on their leaders’ refusal to build a wall against criminals and drug-smuggling. The Democrat plan would expand the pending Democratic plan to spend $1 billion extra for one year on improving security at the “Ports of Entry.” Neither plan is expected to include any funding for a border fence that would constrict the smuggling of drugs nor any legal reform that would reduce the smuggling of workers via the various asylum and “catch-and-release” loopholes. The $5 billion plan is expected to fund “a virtual wall” of sensors. But prior efforts to build a virtual wall proved to be a practical failure under former Presidents George W. Bush and Barack Obama. In 2011, Obama’s deputies canceled a “virtual wall” program that started under Bush in 2005. The $1 billion SBI-Net technology system proved far less effective than walls, but it provided GOP and Democrat legislators with a media-ready excuse for defunding the 2006 Secure Fence Act, which approved the deployment of 600 miles of double fencing along the border. In 2016, the public reacted by electing Trump to build a wall. However, establishment legislators are strenuously opposing Trump’s pro-American mandate. For example, some of Trump’s deputies are now racing to trade Trump’s wage-boosting “Hire American” anti-amnesty policies in exchange for a few billion dollars to build a wall — without fixing the loopholes that allow the trafficking of cheap labor into the U.S. job market. Speaker Nancy Pelosi plans to formally unveil the proposal Thursday evening, after the Senate takes up its own dueling funding measures to reopen the government. Both are partisan bills that are predicted to fall short of the necessary 60 votes. House Democratic leaders are trying to show movement as some cracks in their caucus begin to show in the unprecedented 33rd day of shuttered government operations. 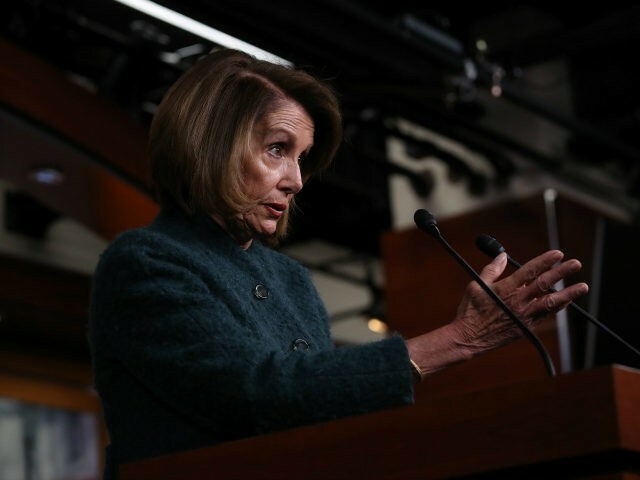 A handful of moderate Democrats have begun to speak out against Pelosi’s strategy of refusing to negotiate until the government is reopened. A small group, led by freshman Rep. Elaine Luria of Virginia, began circulating a letter this week pressing Pelosi to counter Trump’s proposal with her own potential compromise.